Welcome to Endersby Awards, a Cambridgeshire based family company. 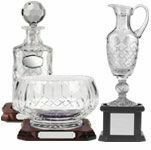 We pride ourselves in being able to provide the very best quality trophies, awards, plaques, crystalware, medals and gifts for all occasions, at very competitive prices. Our customers value us for our personal, friendly and professional service which includes in-house glass engraving, ribbon printing and mug sublimation. Whatever your requirements we are confident that Endersby Awards can meet your needs. Di - Feb 2018 Yet again you provided our Company with a brilliant Presentation Professional Personal Service Great Team at Endersby Awards Fun dealing with you - see you next year! It has been a pleasure to deal with you over the last six years. Your quality and level of attention to our complicated requirements has been of the highest order and we would have no hesitation in recommending your services to our many contacts in the golf sector. Peter Meeds. Hon Secretary, Abbotsley Golf & Country Club. 2016 Thank you for taking the time to engrave our School Trophy at such short notice. Its much appreciated. See you next year. "My Captains Day was a great success! The trophies looked good and everyone loved the keyrings May I thank you for all the hard work your team put in to ensure everything was perfect and ready on time"
Club Captain 2006 - 07 B.G.C "Thank you so much for helping to make our awards evening so fantastic! The Trophies were wonderful and the students were thrilled!" "Thank you for getting us out of a tight spot at such short notice And! for designing us a posh new centre within that timescale! We had a fantastic day and your awards were thoroughly enjoyed " NG S.N.S.F.C. "Thank you for the kindness and support you showed us when visiting your workshop. The memorial plaque is a beautiful memory of our father Thank you"